Yields sixteen 3-inch brioches à tête. True brioche—the classic French yeast bread that’s rich and golden with butter and eggs, boasting a paper-thin crust and a silky, tender crumb—is a rare and wonderful thing. 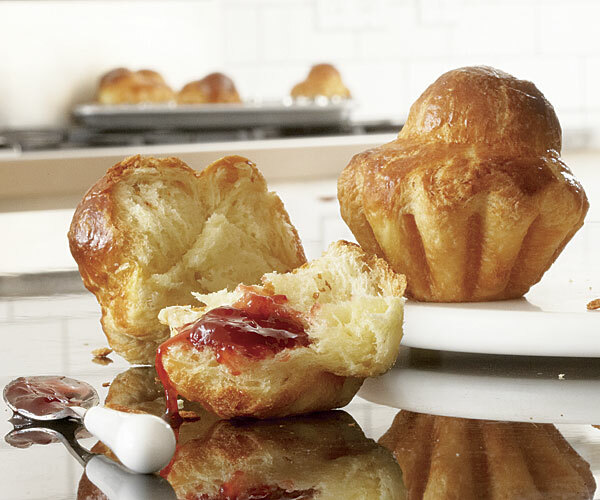 But as special as it is, brioche isn’t difficult to make. To form the “tête,” or head, hold your hand perpendicular to the work surface, with your fingers straight and tightly together (like you’re going to do a karate chop). Working with one ball of dough at a time (keeping the others covered with plastic), press down onto the ball with the side of your hand about one- third of the way from one of the edges of the dough ball (leaving one-third of the dough to one side of your hand, and two-thirds of the dough to the other side of your hand). Saw back and forth with your hand almost all of the way through until you get a shape that looks like a bowling pin, or a head and body connected by a very thin, almost translucent neck. Holding the dough by the “head,” turn the dough upright so the body is resting on the work surface. Lower the head down into the body, pressing deeply into the body and spreading it with your thumbs and index fingers to make a nest for the head. Tighten the body around the nestled head by tucking and lifting the body up around the head. Gently place the dough in one of the prepared molds, body down. Repeat with the remaining dough. Transfer the molds to a large rimmed baking sheet. You can also use this recipe to make 2 full-size brioche loaves or 2 large brioches a à tête. For loaves: After dividing the dough into 16 balls, butter two 8-1/2×4-1/2-inch loaf pans. Arrange eight dough balls in two rows of four in each of the pans. For large brioches à tête: After dividing the dough into 16 balls, butter two 7-inch brioche à tête molds. Place one dough ball in the middle of one of the molds. Arrange six more balls around the side of the mold, resting on the first ball (they won’t touch the bottom of the mold). Place the last ball on top of the dough in the middle. Repeat to make one more 7-inch brioche à tête. To bake both variations: Proof and apply the egg wash as for the small brioches à tête. Bake for about 25 minutes or to an internal temperature of 190°F. Let cool on a rack for 25 to 30 minutes before unmolding. Wrap cooled brioches well and store at room temperature for up to two days, or freeze for up to five weeks. Let them thaw, wrapped, at room temperature. thanks for visiting my site and liking a post. I am excited to find yours!!! I will making Brioche this week and looking at this one to use!! again thanks! !